Live from MetLife Stadium in East Rutherford, New Jersey, home of the New York Giants and the New York Jets, WWE will host the long-awaited WrestleMania 35 on Sunday, April 7th. With many exciting and unpredictable matches in store, let us take a look at which ones to look out for. 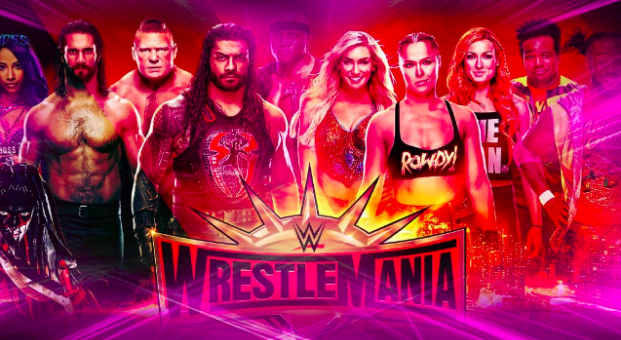 The final match on the WrestleMania 35 card will see Ronda Rousey put the Raw women’s title on the line against 2019 Royal Rumble winner Becky Lynch and Charlotte Flair, who will put her SmackDown title up for grabs. Stephanie McMahon announced on Raw that the fight will be winner takes all, with all titles on the line. As one of WrestleMania’s biggest events in history, this is definitely a match to look out for. As the result of his Royal Rumble victory in Phoenix, Seth Rollins earned the right to choose which world championship he’d like to challenge for on the biggest stage. Rollins chose Lesnar and, though Rollins was unable to compete for a few weeks and Lesnar was off television, last Monday, Rollins got over on the champion with a low blow and Stomp. With great difficulty getting there, Kofi Kingston is going to WrestleMania to challenge Daniel Bryan for the WWE title. No matter the outcome, it is going to be a great match to see a highly-respected veteran, such as Kingston, shine in such a huge spotlight after an amazing career up to this point. On SmackDown Live, Rey Mysterio announced that he would be facing Samoa Joe for the title at WrestleMania 35. Additionally, he announced that his son Dominic would be sitting ringside at the match. Mysterio has been cleared to compete after injuring his ankle last Monday at Raw. Kurt Angle announced that WrestleMania 35 would be his final match of his career, and the McMahon family gave him the opportunity to choose the opponent who will receive the honor of wrestling against him. At Raw in Chicago, Angle announced that his opponent would be Baron Corbin. After much backlash at this opponent choice, one has to wonder if there is more in store for the match (cbssports.com).